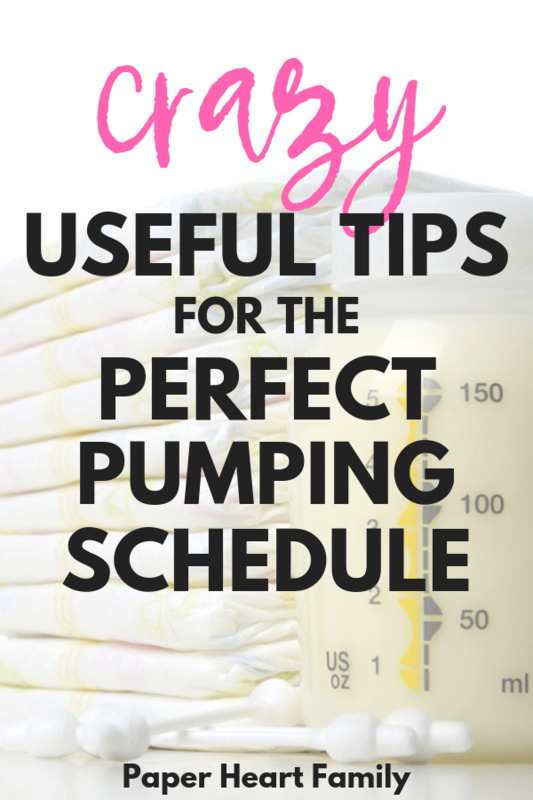 Breastfeeding And Pumping Schedule- When Should You Pump? If you are breastfeeding and trying to figure out when in the world to pump as well, it can feel like a balancing act. 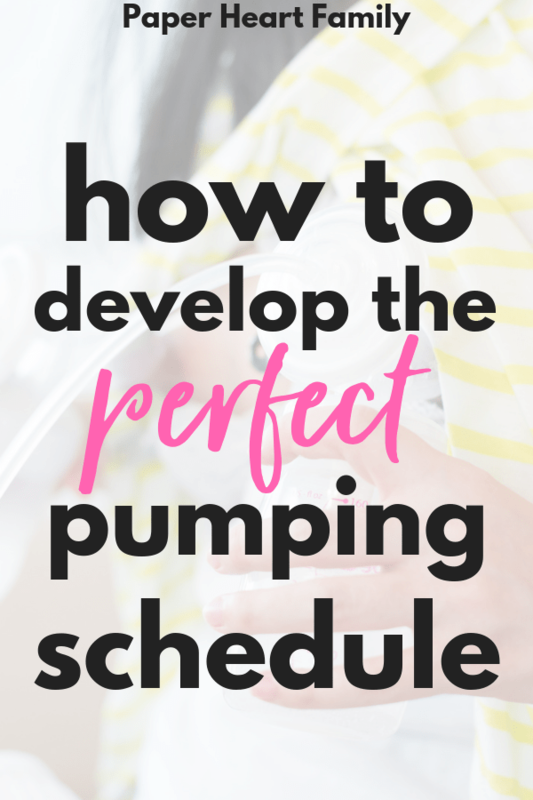 Unfortunately it’s not as simple as “pump whenever!” when you are trying to figure out the perfect breastfeeding and pumping schedule for you. You might be worried about your actual baby not having enough milk because you pumped too close to a feeding. I remember having this exact fear, especially during a growth spurt when my baby’s feedings were sporadic and VERY frequent. Another issue that could arise from haphazardly pumping is causing an oversupply. FYI: Oversupply is NOT good. Oversupply is a very, very bad problem to have, that could lead to a lot of other breastfeeding problems. If you’re trying to develop a good breastfeeding and pumping schedule, you might be trying to build a freezer stash, returning to work or you might be trying to increase your milk supply. I’m going to talk about what you should do in each of these scenarios. When I was breastfeeding, at first, I wanted to create a small freezer stash for when I went back to teaching. However, I was very easily prone to oversupply, so I was constantly worried about causing my body to create too much milk. Later, I returned to work and had to figure out a schedule that worked for me. Even though pumping is a TON of work, I truly believe that the sacrifice is worth it. I successfully breastfed both of my babies for more than a year, and though I was SO happy when I was able to cut that last pumping session from my day, I would do it again in a heartbeat. I did it despite having oversupply issues. I did it despite having a non-flexible work schedule that I had to work around in order to fit pumping in. (If you’re struggling to find a long enough window for pumping, read my tips on pumping more milk FASTER). I did it despite loathing the pump. The Haakaa– This product is GENIUS. It’s a “manual pump” but you don’t have to do any work! Simply suction it to the non-pumping side while your baby is nursing and it will collect milk for you. It’s a great product for when you’re just starting to build a freezer stash. A Pump Bag– I adore my Sarah Wells Pump Bag. It’s stylish (doesn’t LOOK like a pump bag!) and it keeps me organized and helps me pump quicker and more efficiently. Breast Pump Wipes– Perfect for using at work in between pumps. Storage Bags– for freezing your stash. A Hands-Free Pumping Bra– Check out the 4 BEST bras for pumping at work. If your baby is less than four weeks old, I would be very cautious about pumping at all. I know that there are mamas out there that do it and have no issues, but this is a slippery slope. Your supply is simply not regulated yet. Your body still doesn’t have a clue how much milk it needs to produce for your baby’s individual needs, so adding in pumping could lead to some major engorgement and potentially oversupply. If you do decide to pump during the first four weeks, know that your baby’s drinking no more than 2 ounces. At about 4 weeks, your baby starts to drink about 4 ounces, and that amount will likely not increase again, until you introduce solids and it starts to decrease. 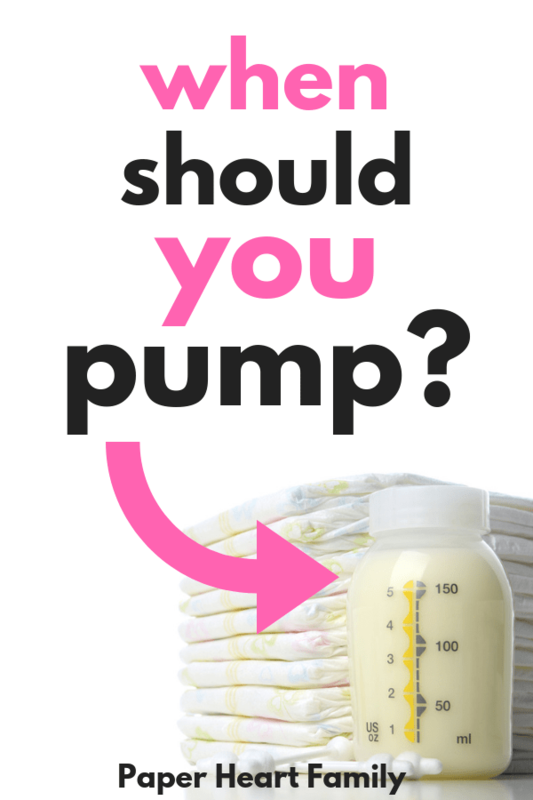 Read more about the best time to start pumping. If you really want to start saving up some milk before your baby turns four weeks old, you need the Haakaa. The Haakaa is a silicone breast pump that you attach to your other breast when your baby is nursing. It collects the milk from your letdowns and even pulls some additional milk from your breast while your baby is eating. I threw away so many milk soaked nursing pads I threw away during my first few weeks of nursing. The Haakaa allows you to catch all the milk that would otherwise be wasted. It can also help you relieve engorgement and manage oversupply in these first few weeks. The Haakaa makes it possible to start your freezer stash from birth because your not actually pumping. You will notice that you naturally produce more milk in the morning (with the highest milk production occurring between 12-4am). But don’t worry, pumping after your baby’s first feeding is sufficient. Pumping in the evening will probably be the least productive, as your milk supply is at its lowest then (this is also one of the reasons that your baby might cluster feed in the evening). If your baby is over 4 weeks old, adding in a pumping session shouldn’t be a problem. I guess we have this belief that having thousands of ounces of frozen milk is going to rescue us when our supply lessens. While having that extra milk is nice, it’s not necessary. I pumped for about 2 months (once per day) before going back to work. Each session yielded me about 4 ounces. So I went back to work with a stash of a little over 100 ounces. And even though there are moms on Pinterest telling you that it’s necessary to have hundreds, if not thousands of ounces frozen, it’s probably not necessary. I read something online the other day that I loved: Feed the baby, not the freezer. Don’t let your “need” to pump overcome your life. When you are first starting to pump, you might be wondering how much milk you should expect to pump. This of course depends on SO many things. The pump is not ever going to be as efficient at removing milk as your baby. Because let’s face it. It’s a MACHINE. A man-made machine. It can’t be better than the original! Even more, it’s going to take your body a little while to respond to the pump. Your body needs to get used to the pump and as it does, you will be able to pump more milk at a time. According to Kelly Mom, it is typical for breastfeeding moms to pump between ½-2 ounces TOTAL per pumping session. If you would like to pump in order to increase your milk supply, try power pumping. Power pumping will only take a little extra time out of your day. Select a set time when you will power pump each day. Should You Pump In The Middle Of The Night? Pumping in the middle of the night is a personal preference. From about 6 weeks until I returned to work, the only time that I pumped was during my baby’s first middle of the night wake-up. My baby nursed from one side and I was able to pump on the other. If your baby is sleeping through the night, I say sleep too! And if you’re dealing with low milk supply, play around and see what works better. While you might be tempted to pump in the middle of the night, maximizing your sleep and being well-rested might help your supply more than a nighttime pumping session. At first, you might find that you are waking up in a pool of your own breast milk (fun! ), but if this is your reason that you are pumping in the middle of the night, then you aren’t allowing your body to adjust to your baby’s new schedule. After a few days of a skipped nighttime feeding, your body will adjust. As I said before, you might stress out and think that if you pump, you won’t have enough milk for your baby at her next feeding. The truth is, our bodies are CONSTANTLY producing milk, and we are never truly empty. Let’s first look at potential breastfeeding and pumping routines if you’re trying to build a freezer stash. I’m going to give options that include one pump a day, as that should give you a nice little freezer stash. Option #1- Pump during one middle of the night feeding while your baby feeds on the other side. Option #2- Pump on one side while your baby nurses on the other side for the first morning feed. Option #3- Pump on both sides immediately after nursing your baby for the same feeding each day. Option #4- Pump 30-60 minutes on the same side after a certain feeding of the day. How often should you pump at work? Three pumping sessions at work would be ideal. You might find that you don’t have enough time to pump 3 times at work, and therefore you might have to add in a pumping session before work (at home) or on the way to work (in the car). This is what I had to do, and since I needed every second of sleep that I could get, I chose to pump in the car. Because of Freemies, it was super easy. Freemies are breast milk collection cups that replace those horrific flanges. You drop them right into your bra. I am obsessed with them! They make pumping so much easier and faster. If you haven’t yet gone back to work and you’re really nervous about whether or not you can make pumping work, my friend Stacey from Milkology can ease your mind with her online and on-demand pumping class. She will hold your hand through every step such as choosing a pump, storing milk safely, building a freezer stash, building and maintaining your milk supply, and what to do if you’re still not pumping enough. Check out her Ultimate Back To Work Pumping Class. Remember, no matter what breastfeeding and pumping schedule you come up with, the most important thing is that you stick to your routine as closely as possible. If your body knows to produce more at that certain time of the day, your supply for that time of day will increase. If you are inconsistent and pump whenever, your body will possibly overproduce, which can lead to many problems. Wow this was the most helpful advice about breastfeeding. You literally answered every question I had. Thank you so much for your help!!!!! You made my day!! Thanks so much for the kind words and I’m glad to help! This was very helpful! I am trying to prepare for my first babe in June and want to breastfeed, with just enough milk supplies for baby to have a bottle once or twice a week (for grandma or dad to feed baby). Nice to know that I can just pump once a day and build up a store and not have to worry about it once I have a good store. Thank you! I’m so glad you found this post helpful! Good luck with everything once your little one gets here! I am a first time mom and my son is just 2 weeks old. This article was super helpful and eased my mind about the pumping process. I am currently just looking to pump and have a supply for when my husband and I start going out or when I need a break and he wants to help out feeding. One question I do have – I also have a Haakau manual pump which has been super easy to use. Can I combine the milk I get from those manual sessions into one bag and freeze? Or do they have to go into separate bags? Hi, Lauren! Great question. You can combine milk from separate pumping sessions, you just want to make sure that the milk is the same temperature (if you pumped earlier today and placed the milk in the fridge, you should cool your newly pumped milk in the fridge BEFORE combining). Hope that helps! This is very helpful. I’m currently at week 3 breastfeeding and pumping to replace supplementing with formula. My little one seems to be hungry all of the time. Pumping allows my family to feed him while I nap. However, my supply is inconsistent (probably because my pumping is inconsistent). What do you recommend in this case? My goal is to have a breastmilk supply to eliminate the formula. I would definitely suggest working on making your pumping routine more consistent. I know that’s hard when you have a hungry baby though, and you feel like he’s constantly nursing! Figure out when you can pump each and every day and stick to it. Try to avoid formula as much as possible and let your baby cluster feed as much as he wants to in order to stimulate your supply. I used to get more milk if I pumped on one side while my baby was nursing on the other. You could also try some lactation tea. I loved it when I was nursing. It’s cheap and VERY effective. Good luck! Hi there. How long do you pump for if baby is nursing on the other side? I would suggest pumping the duration of a normal pumping session. Around 15-20 minutes probably.